Magnetic resonance imaging (MRI) is a tool of medical diagnosis used to examine tissues and organs inside a patient's body. MRI assembles a detailed, readable image based on the response of atoms placed within a strong magnetic field. The MRI can detect small tumors (growths) that might be cancerous. Because cancer cells have a resonance frequency different from healthy cells, they are readily identifiable. MRI can outline areas of soft tissue too thin to be picked up by X-rays. It can also see into large organs. MRI is used primarily to diagnose disorders and injuries of the head and the spine as well as congenital heart disease, cardiovascular disorders, and pelvic problems, and MRI can also be useful for examining the chest, joints, and the circulatory system. The MRI scanner is composed of a large, tube-like magnet, radio transmitters, and receivers, and a computer. The patient lies inside the tube, completely surrounded by an intense magnetic field. Inside the patient's body, the nuclei of certain atoms will spin, wobbling at precise frequencies. Using the radio signals, the computer searches for the frequencies associated with specific types of atoms (such as cancer cells). Once the radio waves are turned off, the atoms emit pulses of absorbed energy. The computer reads these pulses and uses them to draw a three-dimensional image of the scanned area. MRI scanners, which are particularly expensive, are generally found only in large medical research centers. A specially trained radiologist must be present to supervise the procedure. MRI technology is based on an earlier research technique known as nuclear magnetic resonance (NMR), which helps scientists to analyze the interactions between matter and electromagnetic radiation. In 1973, a paper published in Nature first explained how to use NMR on human bodies. 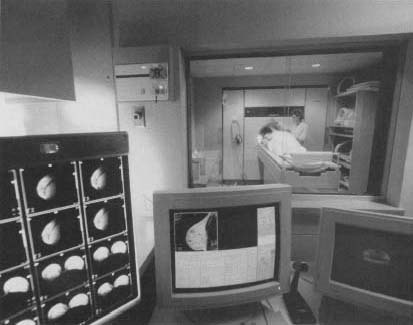 The technique later came to be known as MRI, and since 1981, when it came into extensive use, MRI has proven its tremendous diagnostic value. The MRI technique is also radically different from X-ray technology, because MRI uses no ionizing radiation. An MRI machine. MRI assembles a detailed, readable image based on the response of atoms placed within a strong magnetic field.